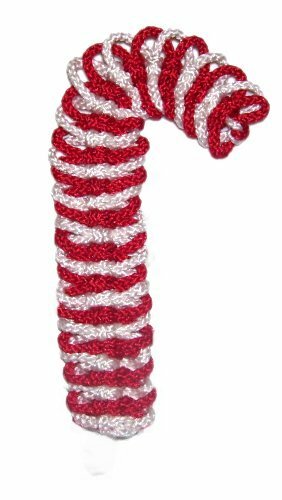 Description: This Candy Cane can be used as a holiday ornament if made with 2mm size material. The finished size is 6 inches long and 1 inch wide. By using 4mm - 6mm size cords, you can make this design larger, for a wall decoration. This is an easy Macrame project, suitable for beginners and children. Preparation: Cut one piece of wire, 15 inches long. Cut one piece of both the red and white material, 72 inches long (2 yards). Prepare the two cords to prevent unraveling. 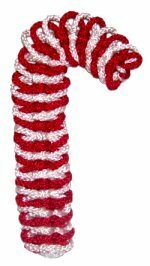 When making the Candy Cane larger, use 4mm - 6mm material, and cut the cords to 3-yards. The wire should be at least 20 inches long. Step 1: Locate the center of both cords. Fold the wire around the center of them. You can now twist the two halves of the wire together if you wish. 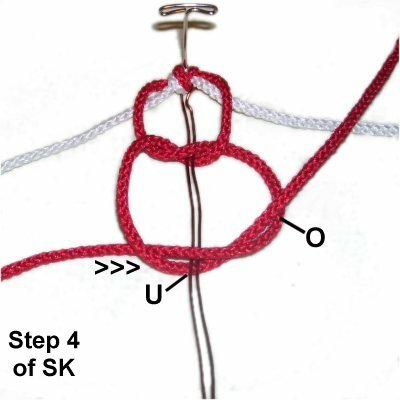 Step 2: Tie an Overhand Knot with the two cords. 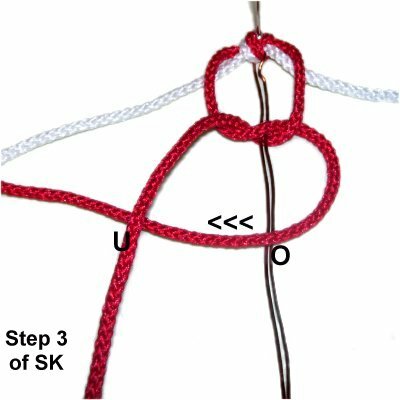 As you are tightening it, arrange the ends so the two colors are in the same order on both sides of the knot. 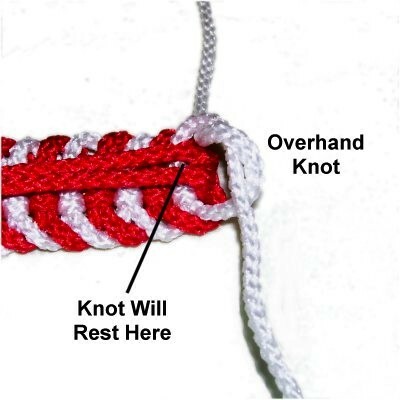 Step 3: The next 4 images for the Candy Cane show you how to make a Square Knot. The wire acts as the filler for the Square knots. 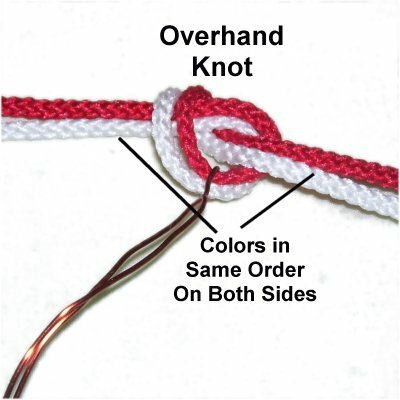 The first knot is tied with the cord at the top, which in this case is the red one. The two halves has switched places, so the left half is now on the right. 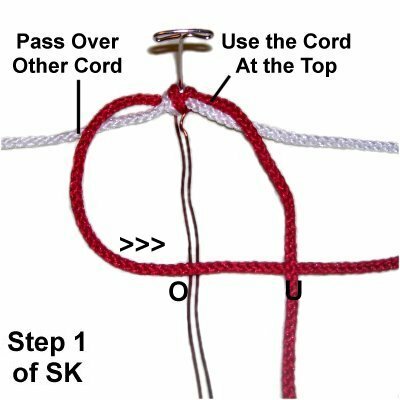 << Place the left half over the wire and under the right half of the cord, as you move it left. 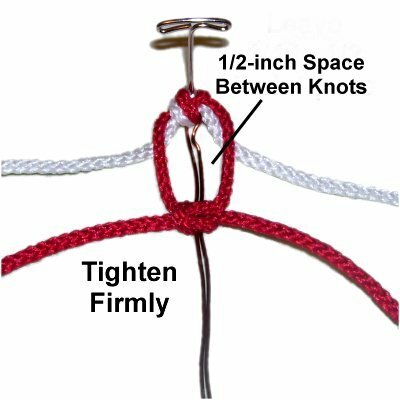 Step 4: Tighten the Square knot so there is a 1/2-inch space between it and the Overhand knot. 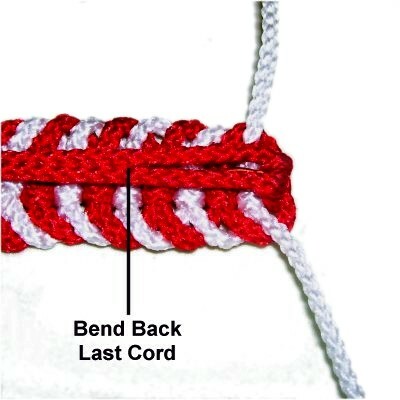 When making a larger version of the Candy Cane, increase the spacing between the knots to 1-inch. 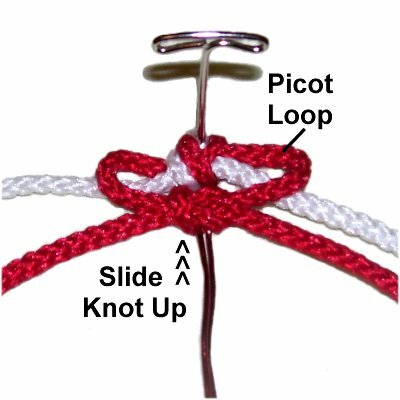 Step 5: To make the picot loops, slide the Square knot up to the Overhand knot. Step 6: Pass the two halves of the other cord over the ends of the cord you just used. 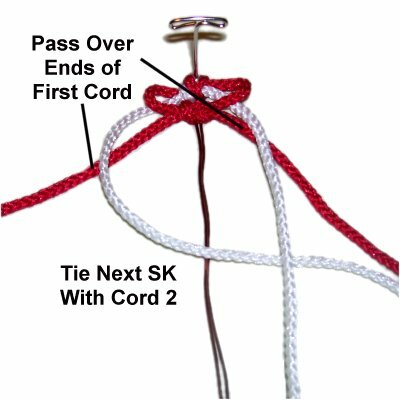 Repeat steps 3 - 5 to tie the next SK with the second cord (white in this example). Step 7: Repeat steps 3 - 6 several more times, alternating between the two colors. Make sure you always pass the two halves of the cord you will be using over those of the opposite color. 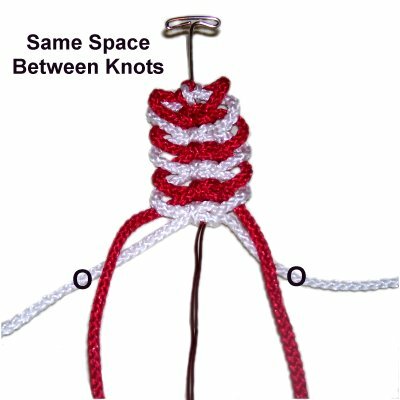 Also, make sure the spacing between the knots is the same, so the picots are the same size. Step 8: When you reach the end of the wire, push the knots close together. 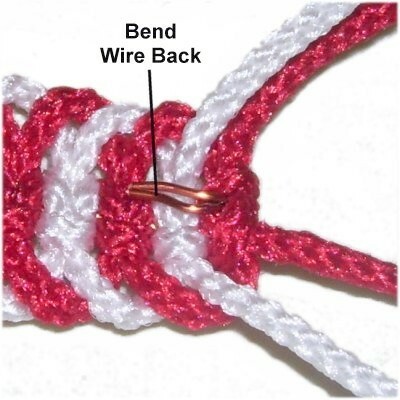 Trim the wire to 1/4-inch and bend it backward. This will prevent the knots from sliding off. 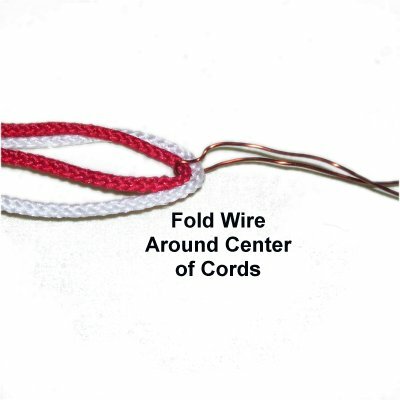 Step 9: Bend back the last cord used, so the two halves are arranged on top of the wire. 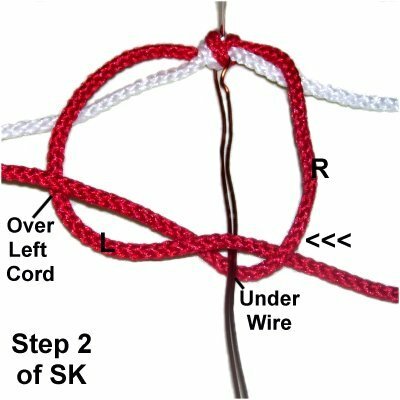 Step 10: Tie an Overhand knot with the two halves of the other cord. It will rest on top of the one you bent back. Apply glue as you tighten. 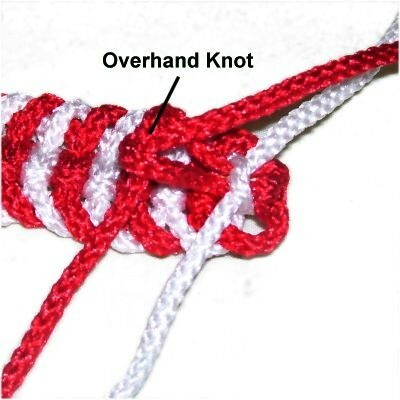 Tie an Overhand knot with the two ends of the cord you bent backward. Add glue while tightening. Trim all 4 ends close to the knots when the glue is dry. Heat the tips with a flame to melt the material (only if using nylon). Bend the Candy Cane into shape, and apply a hook (optional). Have any comments about the Candy Cane? Contact Me.